This is an extremely attractive full color example of John Tallis' decorative map of the Western Hemisphere. Covers both North and South America as well as parts of Polynesia, Antarctica, and Siberia. Shows Texas as both part of and separate from the United States, with a faint but uncolored border – which none of the other states and territories have. Antarctica drawn in only sketchily. Near the southern tip of South America the mythical Aurora Islands are shown. The Aurora Islands were a group of three islands first reported in 1762 by the Spanish ship Aurora while sailing from Lima to Cádiz. They were subsequently and repeatedly sighted several times over the next 90 years. The last official sighting was 1852, after which they were ascribed to myth. No one knows if the Aurora Islands every really existed, but they do continue to appear on maps well into the mid 19th century. 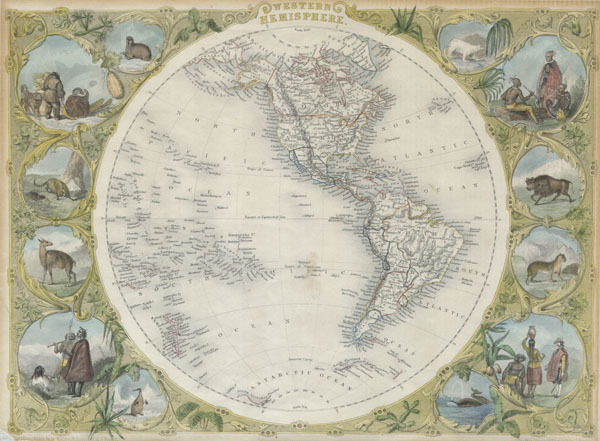 In any case, this beautiful map is surrounded by and elaborate border and 12 full color vignettes depicting the flora, fauna, and peoples of the Western Hemisphere. Vignettes show American Indians, an alpaca, walruses, a bison, a whale, Inuit peoples, and a great polar bear, among others. Possibly the most beautiful map of its type to appear in the 19th century. The illustrations were drawn by H. Warren and J. Rogers. The map was drawn and engraved by J. Rapkin for the 1851 issue of Tallis and Montgomery's The Illustrated Atlas, And Modern History Of The World Geographical, Political, Commercial & Statistical. This Illustrated Atlas… was one of the last decorative atlases of the 19th century. Good condition. Minor acid tranferrence from old mat around outside margin. Minor marginal repair lower left quadrant. Rumsey 0466.005. Phillips (Atlases) 804-4.